The US has ordered $39 million worth of small reconnaissance drones for the US Army. The Black Hornet Personal Reconnaissance Drones are manufactured by FLIR Systems. 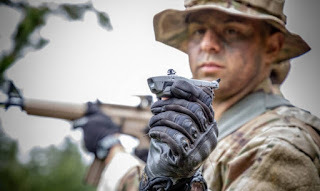 They are tiny, strategic, live video providing drones for soldier/operators on the battlefield. The drones are small enough to fit into a soldier's pocket or in the palm of their hand. They are nano-UAV's (Unmanned Aerial Vehicles) and provide a view of the battlefield. The tiny drones work day and night, with speeds up to 20 feet per second and at a distance up to 1.24 miles. They are nearly silent and provide constant covert surveillance of the battlefield for half an hour. During that time, they transmit live video and HD photos back to the operator. They weigh an ounce and are a little more than 6 inches long. This is incredible technology from a tiny drone. FLIR says deliveries to the US Army are about to begin.